Mathrubhumi Sports Masika July 2014 issue has been published and is now available in the book stalls. The main highlight of this complete monthly magazine for sports will be World Cup 2014 special. A wide spread poster of Neymar will be truly special for the football fans. Being the most favourite sports magazine, sports lovers of Kerala keep it close to their hearts. 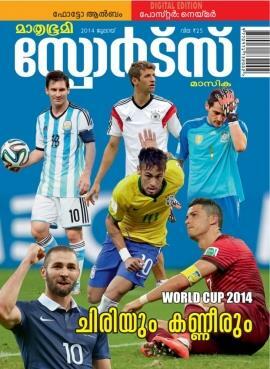 Mathrubhumi Sports Masika July 2014 issue has been published and is now available in the book stalls. The main highlight of this complete monthly magazine for sports will be World Cup 2014 special. A wide spread poster of Neymar will be truly special for the football fans. As the world cup reaches its final leg, the football fever is at its extreme stage. Interesting articles on football along with predictions and opinions from sports specialists makes this issue extraordinary. Being the most favourite sports magazine, sports lovers of Kerala keep it close to their hearts. The cover story on world cup 2014 'Cup of stars' written by R Gireeshkumar carries the soul of football. A well crafted article purely keeping in mind of the readers, it gives a complete reading experience. Third Eye, a column handled by C P Vijayakumar zooms into the world cup journey of Spain. The former world champion Spain which was considered to be a tough competitor in the 2014 edition of world cup failed to win a single match giving disappointment to the football fans. Giving an insight into the national and international sports events, 'Mathrubhumi Sports Masika' is well liked by readers. As people of different ages are sports freaks, they use this magazine update themselves about their favourite sport event. Printed in multicoloured pages, this issue of Sports Masika comes along with enchanting photographs from FIFA World Cup football 2014. Being a regular reader of 'Sports Masika', the thrills and excitement offered by it cannot be found anywhere. As a core team of passionate youngsters works with dedication, this issue will be much special for the readers. Unlike, other magazine of the genre, 'Sports Masika' is packed with high profile articles keeping the excitement till the last page. So a dedicated sports fan cannot miss the current issue. Coming at an affordable price tag, this issue of 'Sports Masika' can fit the bill.